Genuine Volkswagen Parts at the Lowest Prices Online. OEM Volkswagen Parts with Fast, Affordable Shipping and A Price Match Guarantee. Over 3,000 5-Star Reviews (and counting). 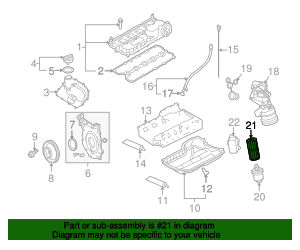 At VWPartsVortex.com, we GUARANTEE that you won’t pay too much for a genuine OEM Volkswagen part. Because we’re happy to match the price of any Genuine OEM VW part*, you can look-up the VW parts you need with confidence. Since 2006, VWPartsVortex.com has been helping VW owners get the best quality replacement VW OEM parts available. If you need a great deal on a factory-replacement Volkswagen OEM parts, you’ve come to the right place. Get started by searching our website for the parts you need. If you can't find the part you're looking for, call 888-687-8938 and we'll help you look it up.